Before the canopy or light shows covered downtown Las Vegas, it was called Glitter Gulch for the many large and unique signs that lit up the streets. 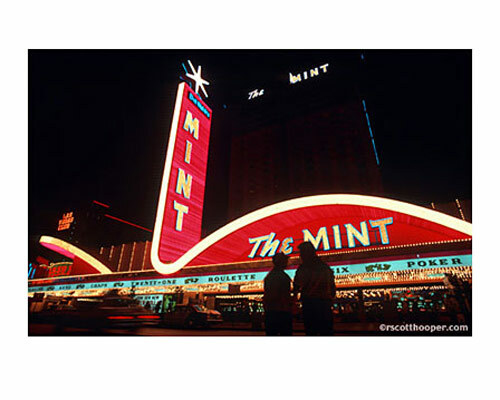 The Mint Hotel, famous for the largest desert race in the world, the Mint 400, was a staple of downtown clubs. They also had one of the finest gourmet restaurants called the "Top of the Mint" that overlooked the entire city. Have you ever collected a picture taken from Fremont Street of the Horn of Plenty with the million in silver dollars in the Mint Hotel? No, but I'll bet I know who took it! RSH Who would that have been? Try the Las Vegas News Bureau. Is there anyone there from the 60s through 80s who remembers Imelda "Sweets" Melancon? I was told she organized the first flying turnaround from Alaska.